Grilled tomatoes are a perfect side dish to a grilled meal. They are quick and easy to make and provide an interesting way to enjoy fresh tomatoes. You can try our Fried Green Tomatoes Recipe for another great way to serve cooked tomatoes. This quick-and-easy BBQ sauce can be prepared in the time required to heat the grill. Kids like the sweetness of the sauce, but the heat can be raised to suit any taste. This barbecue sauce is especially good on chicken or pork. A delightful, easy fruit dessert. 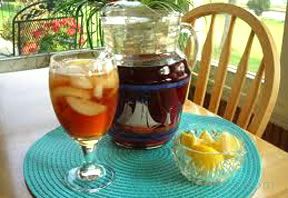 This is how you make great southern sweet iced tea.